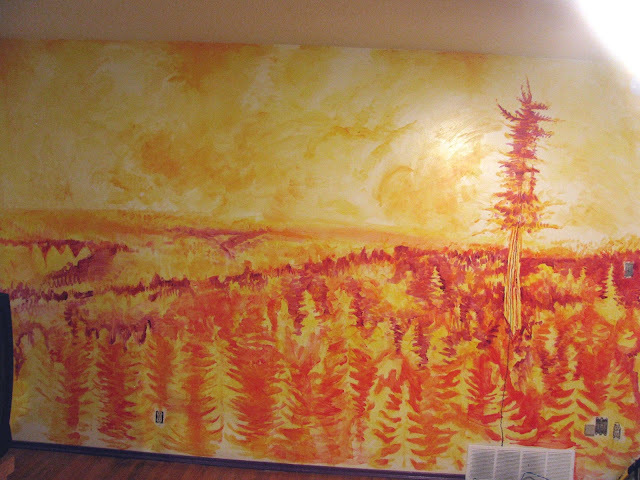 Dare to be Different...paint a mural! My daughter Ilara's friend Meredith Stults was invited to drop in to help push the Dare to be Different mural over the top on the last day of painting. Which was a good thing, as she dove right in to work on the deep dark shadows in the old-growth forest. Meredith clearly enjoyed herself, as was evidenced by her great, relaxed brush-strokes. 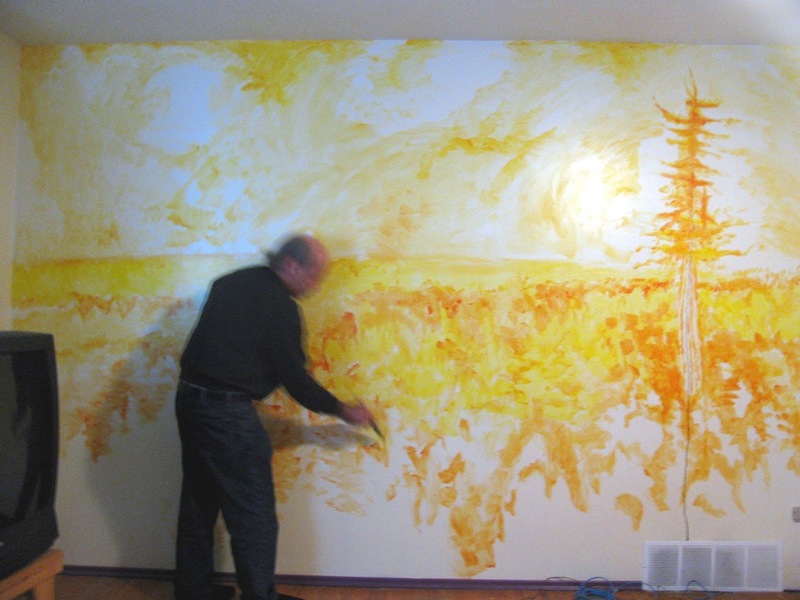 Working on a large-scale mural (albeit this is one of the smaller ones; though the same general rules apply) it is critical to keep the flow of the brush-work loose and fluent. Too much 'pickyness' or tightness tends to dampen the free flow of painting on this scale, so I always encourage my proteges to stay loose, keep breathing and to go with the flow of the piece...to be 'in the moment'. Sprinting to the finish line with a bit of extra help. 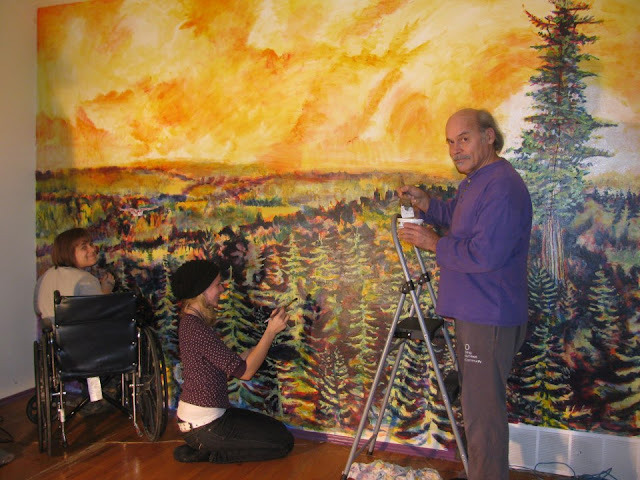 Meredith Stults readily 'took' to the mural-painting medium and methodology with just a bit of coaching. I encouraged her to think of painting the shadowy 'shapes' that were already being set up in and around the trees, rather than thinking about painting 'trees' per se. With this little tip she was off and running. I saw her brush-work suddenly loosed up and she transformed before our eyes into a confident large-scale painter. In a way, painting on this scale is like a dance that the artist has with her brush and the paint. There is a certain rhythm and flow to the application that takes on a life of its own when the artist is able to breathe and relax into her work. The physicality of painting takes a front seat with this technique. 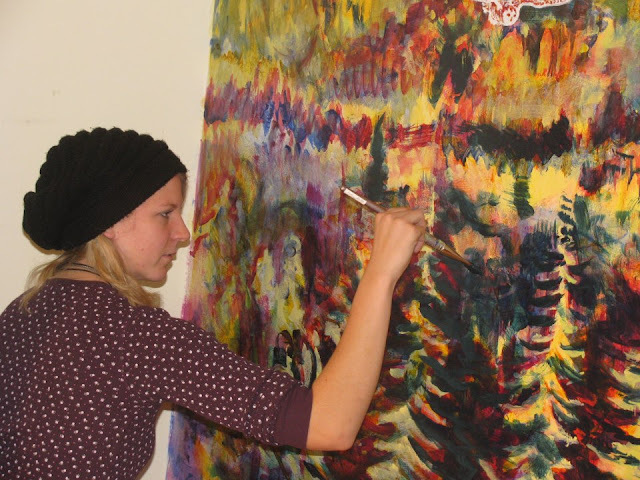 Meredith Stults focuses intently on the rhythm and flow of her brushwork. Ilara decided early on that there ought to be an owl soaring overhead in the mural. At first we thought about making it quite large so that it would appear to be close to life-size and therefore close to 'us' in the extreme foreground of the image. After some deliberation however, we decided that the owl would look better pushed back to a place (in virtual space) where it hovered over the tree-tops of the old-growth forest. 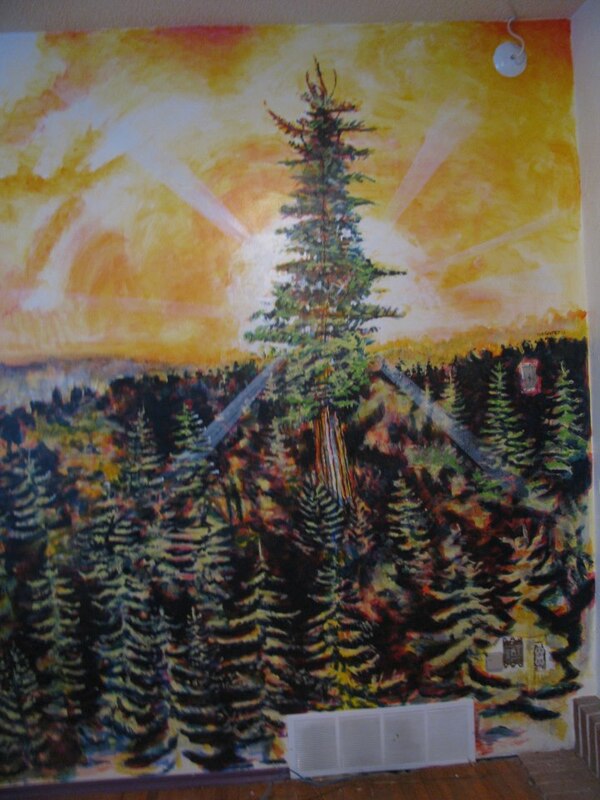 This ended up being the right choice, as it would have over-powered the composition and in doing so would've diminished the sense of scale that we had granted the central focus of the design, namely the giant Sequoia redwood. 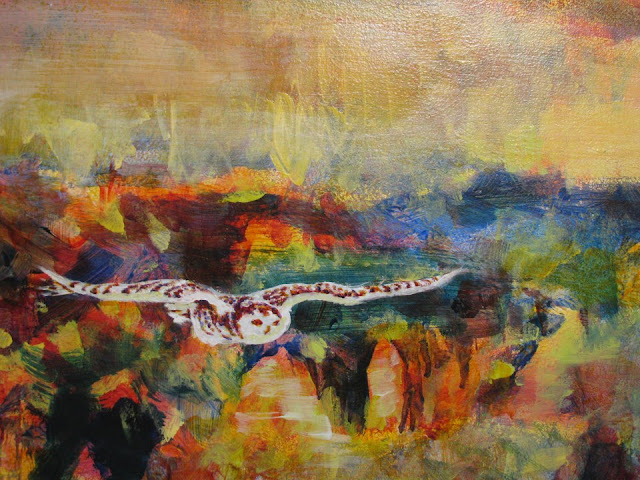 Ilara introduced the idea of an owl into the composition. Here is a detail that shows it against the soft-focus background. When I first saw the picture of the rare giant Sequoia in National Geographic before Christmas, I was haunted by the image of the solitary megalith soaring so incredibly high above the old-growth forest. I wondered why there was only one in the entire vista of the photograph. After reading the article, I came to realize that the reason was simple, though ultimately ignoble. All of the others in what had one been a huge grove had been harvested over the years for lumber. Only a scant 10 % of these gigantic monoliths have survived into the modern age. This is tragic and ironic, as some of the eldest ones living today are in excess of 3000 years old. I felt blessed and honored then to have the opportunity to honor them in this small way. Detail shows the sun setting behind the giant Sequoia Redwood, with transparent rays piercing into the shadowy depths of the old-growth forest. One of the best shots of the Dare to be Different mural was captured by Ilara with her Android device. 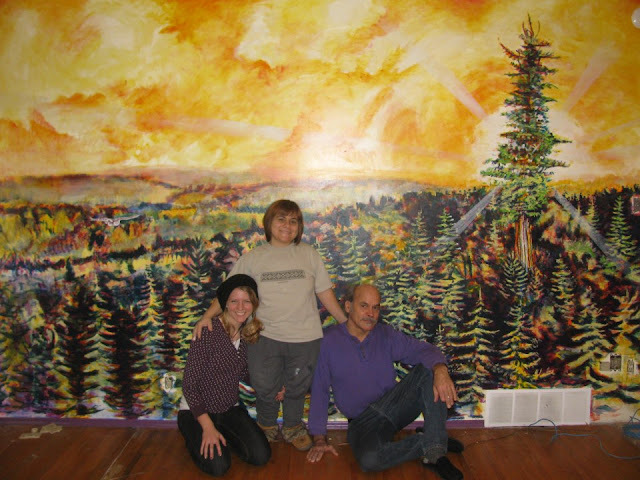 Meredith Stults, Ilara Stefaniuk-Gaudet and I pose in front of the mural right after its completion in Edmonton Alberta. While we were working on the mural, we watched an amazing Ted Talk by Richard Preston that reveals some mind-blowing secrets of the giant Sequoia trees of northwest California. These trees are SO huge, for example, that they have been known to support permanent pools of water in their upper crotches that in turn support an exotic and diversified ecosystem all of their own including a relative of the 'plankton' formerly thought to live exclusively in the oceans. Remember, this is happening at heights of up to 380 feet ( equivalent to a 38 story skyscraper) in these magnificent trees! 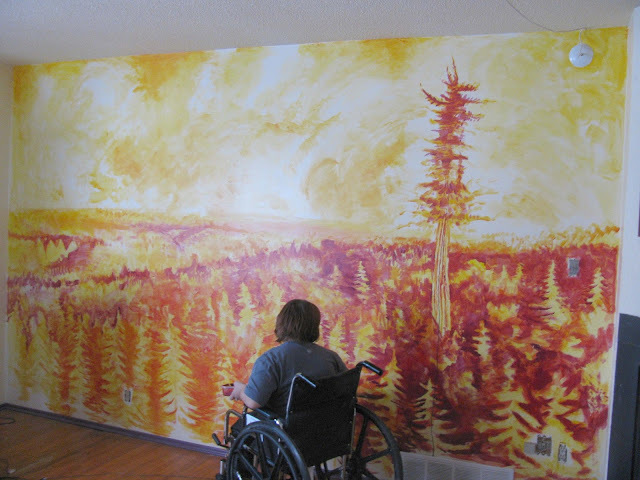 I went to Edmonton in early January 2013 to visit my daughter and after I arrived she and her housemates asked me if I wanted to do a mural on their 14' x 8' living-room wall. Or maybe I came up with the idea, the details are just a little blurry about who conjured up what but the end result of our brainstorming session was...there is a prominent crack in the wall, on the right-hand side that might be integrated into a design rather than simply mudded over. This crack ran vertically up the wall from a 1/4 inch base to a hairline at the top. Could the crack be made to feature in the design? I'd seen a three-page fold-out in the December issue of National Geographic that showed one of the world's tallest tree and was intrigued with the haunting image. So I suggested that the tree, which soars to over 380 feet (38 stories) over the canopy of the old-growth forest below, be the theme of the mural...as it would doubtless create the illusion of plunging space 'within' the wall to add more dimension to the modest-sized space. Once we had all agreed to the basic gist of the design, the project was rapidly launched by the first 'study' glaze to start the separation of light from dark. The first sketchy orange glaze will quickly separate the light from the shadow. 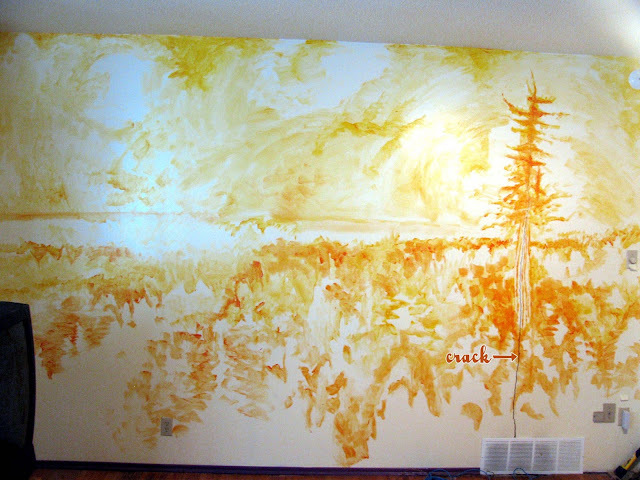 In this case, the best way to proceed was to paint directly onto the wall with a large brush, unaided by a preliminary sketch in pencil. This is a great way to keep a composition fresh and vibrant, as it becomes a record of the 'physicality' of the brush-strokes or a recording of the artistic process in its raw form. You can see where the crack in the existing wall becomes a visual and even tactile anchor for the positioning of the giant Sequoia that springs up and high above the lofty heights of the old-growth forest canopy far below. As usual, the job at hand is to separate the light from the dark. The dark must be a foil for the objects of light. so it makes sense to paint at first the designate 'negative space' or the darkness where objects appear as light against a dark surround. Conversely, when an object is seen as a dark shape set off against a lighter field, it must be perceived as a 'positive'. The early glazes are kept lively and fresh to be later clarified to a certain degree using as the mural-painters approach of large fluid strokes. Keeping the early glazes fresh as large, loose and free-flowing as possible to coax out the images with as much expression as desired. Subsequent glazes will provide ample opportunity to refine the visual fingerprints until they ring with authenticity. You can see the giant Sequoia towering above the canopy of the old-growth boreal forest with just the first three glazes in progress. What is dark? What is light? Herein lies the difference. It's called "global glazing" for a reason. Each progressive glaze is applied throughout the entire mural as required so that the whole wall progresses in a wave. There would never be 'micro-managing' of isolated details, rather everything is painted with equal attention continuously. Ilara Stefaniuk-Gaudet was largely responsible for the 'negative space' in the old-growth boreal forest . 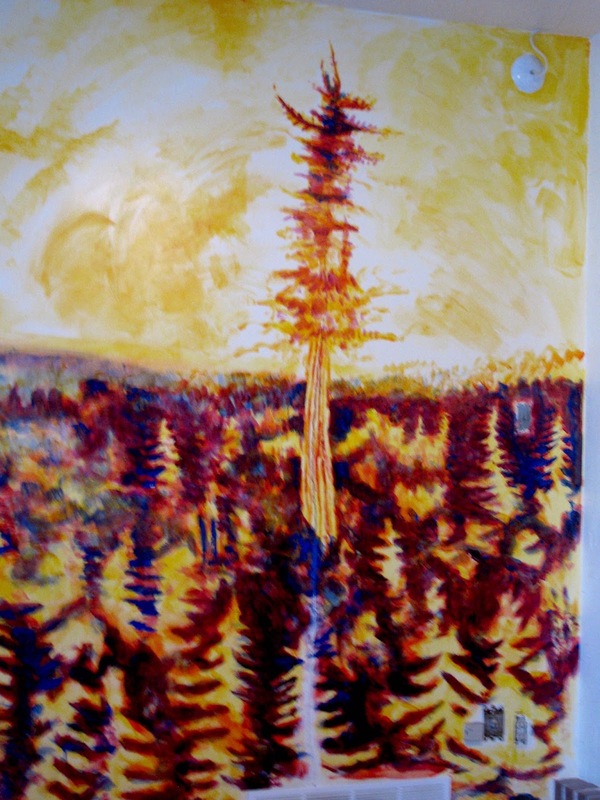 Ilara Stefaniuk-Gaudet was largely responsible for the 'negative space' in the old-growth boreal forest and beyond whereas I had set it up with those first few defining glazes. Much more to come! Only the top of the crack was left visible from the base of the giant trunk where it emerges from the depths of the canopy. Beneath this the crack is filled. I requisitioned a pail of crack-filler to BURY the crack-in-the-wall below the visibly lower trunk of the giant Sequoia. That way, it would appear to spring out of the canopy, invisible in the old-growth boreal forest. Beneath this the crack is filled and buried to enhance the visual oomph of the integration of the self-same crack into the texture of the ancient trunk above to its very tapered tip. Working with the anomaly of the surface can yield stronger results than merely covering them over, in some cases. Everything is painted on a larger scale in mural-painting as this close-up of Ilara working on the negative space shows. The mural-painting technique is specific in that everything is painted with larger-than-life strokes. Anything else would defeat the purpose of the medium and genre. While a mural may certainly look lovely at close inspection, the visual impact must be greatly enhanced at a distance. Building, always building transparent glazes until the 'negative space' is positively separated from the light, leading to 'native' or local colors.